Since 1660, the Poller family has been farming mixed agriculture (including wine) in the town of Röschitz in the western part of the Weinviertel region, near the historic Austrian village of Retz. In 1920 Johann Poller (the grandfather of the current winemaker Erwin Poller) started focusing exclusively on winemaking. He began by producing wine exclusively for his brothers’ wine houses in the city of Vienna. He transported the wine casks on horse carriage to these popular wine houses, a round-trip journey of 95 kilometers that took 3 days. Erwin was intrigued by every aspect of winemaking from childhood and was creatively inspired. He took over the winery in 1994 at the age of 24. He broadened his experience and knowledge of winemaking by visiting and working in the major wine regions of France, Italy, Germany and the US. Since his takeover of the winery, it has grown exponentially, and has brought the winery to its current high quality status and image. Erwin Poller is completely hands-on and involved in every aspect of the winemaking, to assure the purity and terroir driven quality of his wines. He uses sustainable methods in the vineyards and hand harvests. He even goes so far as transporting the grapes in small 20 kg bins to assure gentle transport from the vineyard to the cellar. (The bin are washed daily exclusively with spring water) In the cellar, the grapes are hand selected three times and gently pressed in pneumatic presses to assure that no bitterness is introduced to the must. 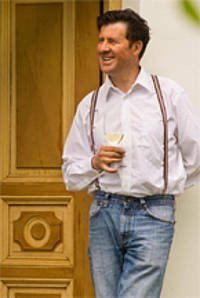 Erwin has created his own yeast culture for use in all of his wines. Grüner Veltliner is the most important grape in the Pollerhof winery and produces classic and distinct characteristics: peppery and fruit forward. Among some of the other grape varietals Poller grows are Riesling, Muskateller, Müller Thurgau, Sauvignon Blanc and some red varietals, such as Blauburger and Zweigelt.